Comments on designing mobile applications. Once a month I attend the Newcastle Coders Group, where they have presentations on coding and other topics. Last month there was a presentation by Andrew Coates from Microsoft on writing your own plugins for Office. 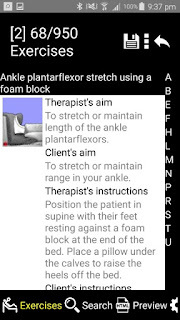 This seemed quite easy so I wrote my own plugin for the website physiotherapy exercises in a day or so. You can use any server technology you like to provide the content, it does not need to be ASP NET. You can write plugins for excel, mail, powerpoint etc. This one is for word. You can create an office plugin using Visual Studio 2015 community edition, more details can be found here. A tutorial for developing your adding can be found here. Microsoft provide their own (html based) UI Toolkit, called fabric for developing office apps. It can be found here. You can get a free developer account with a one year subscription to office 365 and then submit your app on the seller dashboard. Make sure your application version is exactly the same, including all the decimals (for example 1.0.0.0). So why don't you try making one for your own website? 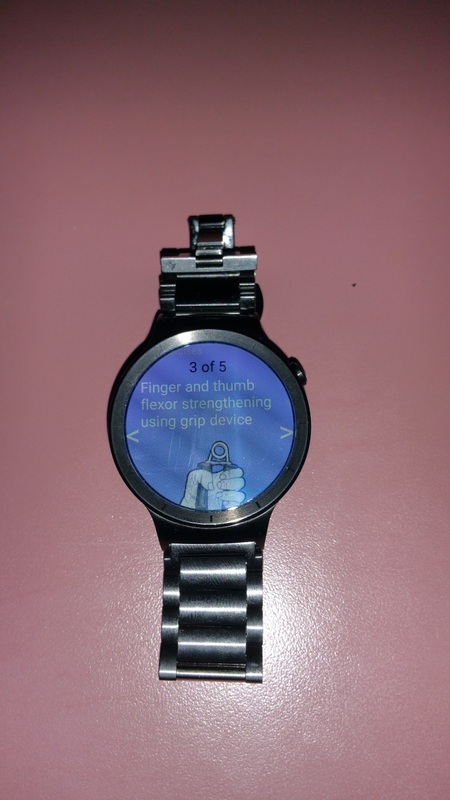 Back in November I blogged about making my app usable on an android wear watch. At the time this was a prototype. 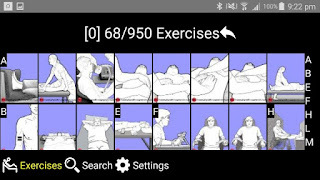 I have now got it working nicely with communication features from the phone to the watch, so you can select exercises on your phone and then push the selection to the watch. All you need to do is have the application currently running and open on your phone and watch and make your selection. To do this, I had to write some android code using Android Studio and the wearable component of google play services. Messaging between the phone and the watch is covered in the google development documentation here. These examples are both also very useful. Using a bit of trial and error and the blog post here as well documentation on building plugins I managed to get it working. 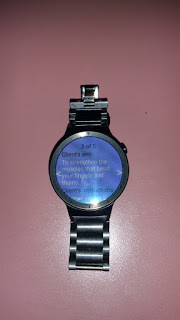 One class is used to send and receive messages for google play services and start the listener for messages on the watch. * Sends a message to the connected mobile device, telling it to show a Toast. The second file is an interface, used as a bridging mechanism between the android code and nativescript. * Created by Peter on 1/01/2016. The build.gradle file is set up to build a library file. Once built you can use the library aar file in plugin. The manifest file needs to contain a reference to the custom WearListenerService. This will then be copied into the overall AndroidManifest file. The plugin needs to be installed on the mobile phone and watch versions of the code. Messages can be sent to/from each device. A snippet of the code for the model can be seen below. Telerik put out release 2 of their Telerik UI at the end of October and I blogged about it here. There was a number of issues with it, that preventing me from using it to the full potential and I am happy to be able to say, these have almost all been fixed in release 3. Important fixes in release 3. Any elements you have bound in the itemtemplate now reflect changes from your model. The ListViewLayout can now be changed programatically and the changes are reflected by the UI. The ItemTap event used to be triggered twice when you tapped on an item, this has been resolved, so it can now be used as expected. Ability to block UI updates while you do changes to the source collection which results in better performance. The ListViewGridLayout option allows you to set the number of items displayed as columns or rows (depending on the scroll direction). At this stage, it hasn't been designed for fixed width columns with a varying number of columns, but you can do this programatically by determining the screen dimensions using the platform module and listening for changes using the application module (fix 2 above). So on my Galaxy Note 4, it displays 4 images across in portrait mode and 8 images across in landscape mode, as can be seen below. There is a ItemTap event which you can you use to do the first action. I have used this to indicate selection of records in the model. This displays a green tick in the image (fix 1/3 above). There is no LongPress event available, but you can do this by using the new built in selection functionality with selectionBehavior set to LongPress. This displays a popup window with the exercise detail. After selection, you need to programatically deselect it again. Adding to our settings section the ability to choose three different RadListView layouts. This way the user can decide to select exercises in the way they are most comfortable. If you use the ScrollToIndex option in GridView layout, it sometimes does not repaint the UI correctly. I have raised a ticket for this and hopefully it will be fixed in the final version coming out in March. This tweet detailed how you can use FontAwesome in your Nativescript app. All you need to do if copy the font into the app/fonts folder. I thought I would use this to make some simple controls to demonstate what is possible. Here is some example code for an image button, checkbox, radiobox, rating and tick button. 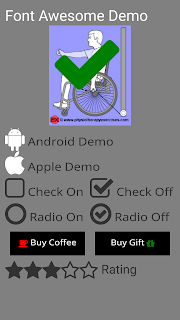 The checkbox, radiobox and rating can all bind to values and change when you tap them. As outlined in the documentation, you need to make a reference to the custom control at the top of the page. Typescript code behind it is as below. Note there is a converter to allow you to use the standard FontAwesome icon names. Note that there is a small bug with the way this works for spans. This is being worked on by Telerik. Hopefully this may be useful to you and give you ideas what you can build yourself. 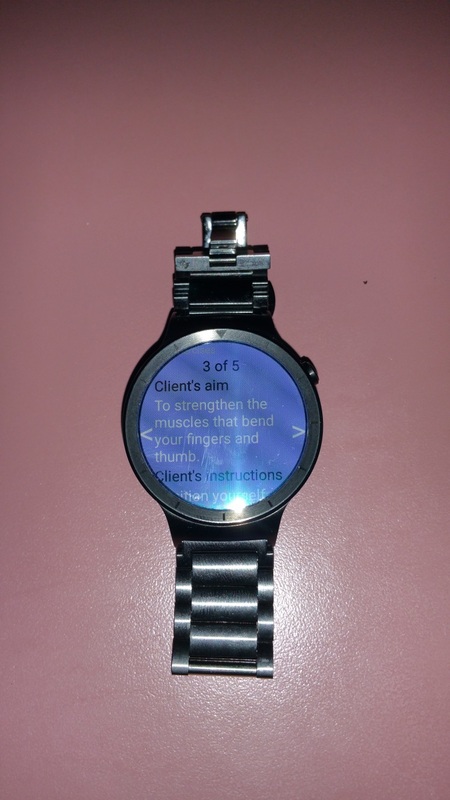 Did you know nativescript can run on Android Wear? Well it can. A while back telerik posted a blog post about it. This was in May and focused on using Android XML files and is a bit out of date, so I will try and extend that using a more NativeScript approach. 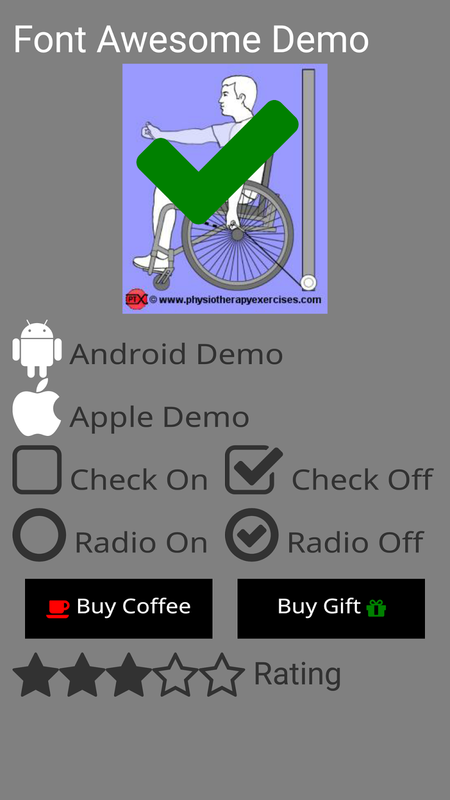 I thought I might as well extend some of the features of the Physiotherapy Exercises app I was working on so it would work on watchs. 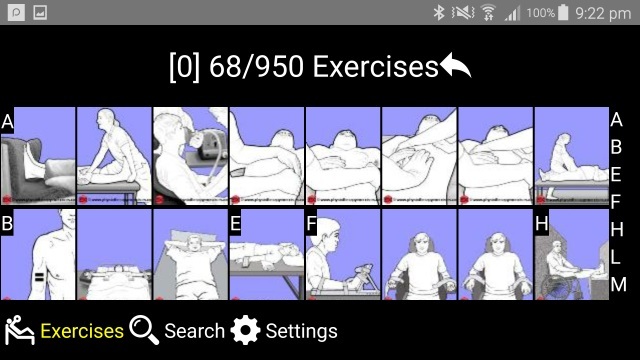 The current idea is to let people with a watch view selected exercises on their watch. They can use the arrows to navigate back and forth. They can scroll up and down to see the text. 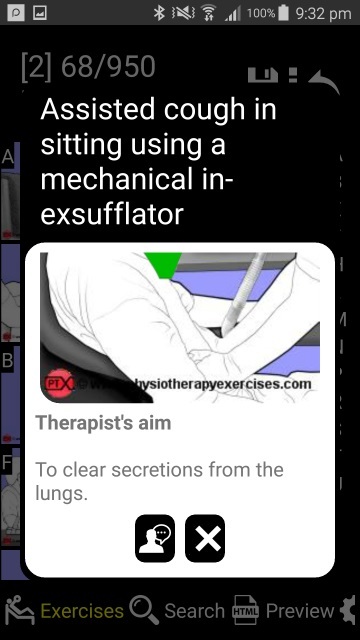 Finally they can tap the exercise to toggle between text and image or just images. To get started, you can just create a standard nativescript project. This is an early prototype, I have not set it up to use observables, be written in typescript and read data from other sources yet. This is just demo code. The xml for the main page is. progression: "Less advanced: 1. Provide hand support for balance. 2. 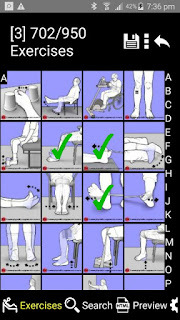 Decrease the height that the leg is lifted. More advanced: 1. Increase the height that the leg is lifted. 2. Increase the movement of the raised leg (eg. add knee extension or hip abduction)." progression: "More advanced: 1. Progress using strength training principles." progression: "Less advanced: 1. Use a lightweight ball or balloon. 2. Position the patient closer. More advanced: 1. Use a heavier ball. 2. Use a smaller ball. 3. Change the speed and trajectory of throw (eg. 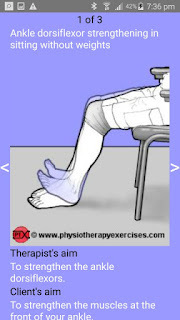 throw to either side of the patient)." progression: "Less advanced: 1. Take smaller steps. More advanced: 1. Take larger steps"
Google have quite a bit of documentation on how to write your app. Note that I do not think nativescript supports the Wearable UI library directly (in terms of typescript definitions, xml options), so I have just tried getting a layout that works using what is available with "vanilla" NativeScript. 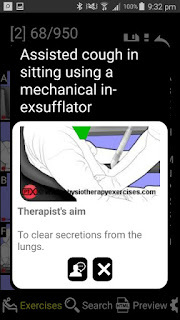 The arrows fill up the left/right rounded section, the number of exercises fill up the top rounded section leaving the remainder for scrollable content. I tried using gestures but it does not seem to work with the gestures already built into android wear. You cannot run your app on your watch using the tns commands, you have to use adb. After your install it, you have to uninstall it first before installing it again. Where package name is the name of the package as defined in the android manifest. You can also just run your app on your Android mobile phone using standard tns commands, but you have to remember that it isn't very representative in terms of screen real estate space. Deploying an app to your android wear watch is different to deploying to your phone as you cannot just connect it up via a micro-usb cable. You have to package your app inside your phone/handheld app and also it must be built in release mode. This is taken directly from the google developer docs found here. 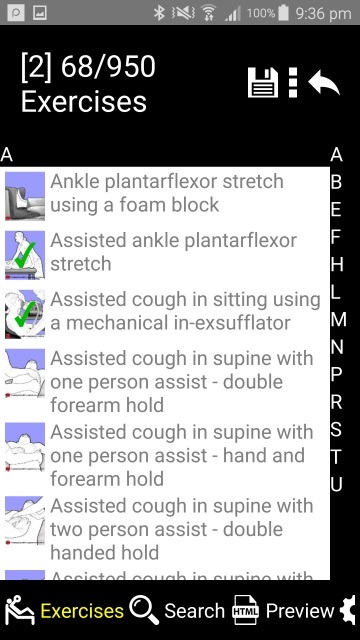 Include all the permissions declared in the manifest file of the wearable app in the manifest file of the mobile app. For example, if you specify the VIBRATE permission for the wearable app, you must also add that permission to the mobile app. Ensure that both the wearable and mobile APKs have the same package name and version number. 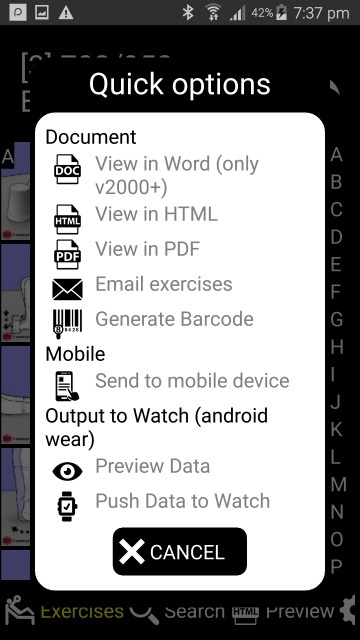 Copy the signed wearable app to your handheld project's res/raw directory. 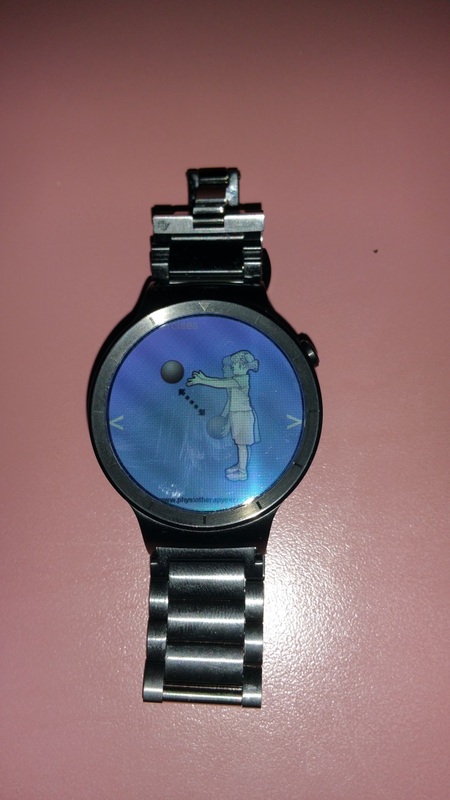 We'll refer to the APK as wearable_app.apk. The package, versionCode, and versionName are the same values specified in the wearable app's AndroidManifest.xml file. The rawPathResId is the static variable name of the APK resource. For example, for wearable_app.apk, the static variable name is wearable_app. Add a meta-data tag to your handheld app's tag to reference the wearable_app_desc.xml file. Build and sign the handheld app. 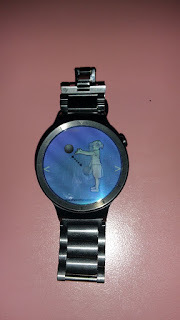 Once you deploy this to your phone, it will automatically be uploaded to your watch. Start android phone app first by clicking "Tap to Play"
Start watch by clicking "Tap To Play"
A larger version link is available here.